We’re delighted to announce that Sophie Teasdale received a 2017 CIFE Award this April for her exceptional contribution to Bath Academy. 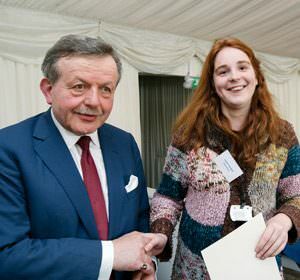 She received the award from CIFE President Lord Lexden at a ceremony in the House of Lords. Sophie has had a very challenging journey over the last six years. In September 2009, aged 12, she was prescribed a common medication and suffered a severe reaction resulting in chronic fatigue, dizziness, involuntary shaking and difficulty in walking. She was often unable to attend school and missed most of her teaching during year 10 and 11 and took her GCSE exams at home. When she started at Bath Academy, she was unable to take more than a few steps unaided and the quantity and timetabling of her lessons had to be carefully managed. Sophie studied A Level English Language and Literature, French and History. This was a huge achievement and testament to Sophie’s grit and determination to manage her condition and forge an independent life and career for herself. Sophie is now enjoying reading History, Philosophy and Ethics at Bath Spa University.